Liz still has a full tube of her Tom’s, so I was happy to pick some up at Winding Way Farms. (Truthfully, I have still been using the mainstream brands… tsk tsk.) 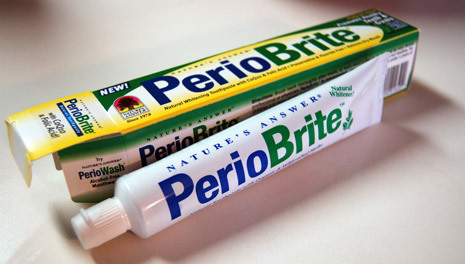 I’ve had natural toothpaste before and have to agree with Tiff that despite the bland color, this toothpaste has a very minty kick. As for those great ingredients she mentioned, some examples are black walnut green hulls, grapefruit seed, Green Tea leaf and Echinacea. 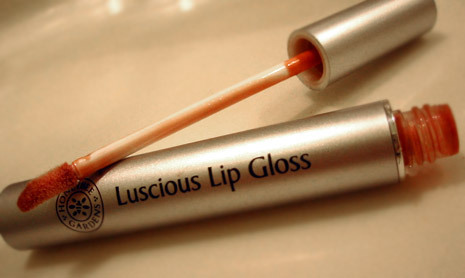 For more about their ingredients (and other products), visit the Nature’s Answer web site. Do you have a great tip or recipe you would like to share? Go ahead and send it our way! We do a lot of product reviews here at Green-Lemonade.com, but we want you (our readers) to know that we, in no way, get any money for endorsing them. While we get a lot of emails suggesting products that may interest our buyers, we always “test drive” them first (unless specifically noted) and do not receive any profit from our posts about them. If we ever do advertise a product for profit in the future, we will certainly make sure that our readers know it, loud and clear. 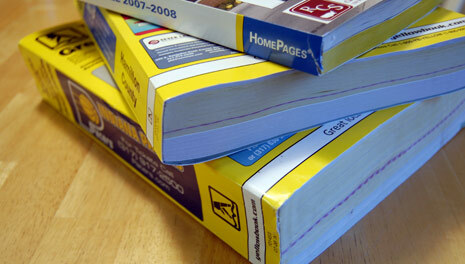 Perhaps you have already cut back on junk mail, but you are still receiving a plethora of phone books multiple times a year. If you’re like me, you rely on the internet and free information via your cell phone to access your local listings, and don’t really have a need for the traditional printed directory. If that’s the case, you have to check out YellowPagesGoesGreen.org, a site that allows you to sign up and stop the delivery of unsolicited telephone books for free! According to the YellowPagesGoesGreen.org web site, over 500 million of these directories are printed every year to produce 500 million books: 19 million trees need to be harvested, 1.6 billion pounds of paper are wasted, 7.2 million barrels of oil are misspent in their processing (not including the wasted gas used for their delivery to your doorstep), 268,000 cubic yards of landfill are taken up and 3.2 billion kilowatts of energy are squandered. It seems as though spring has finally sprung here in upstate NY (thankfully!) and so marks the coming of asparagus season. Since it’s available seemingly year round in some of our big-box groceries these days it may be easy to forget that the freshest, most tasty, asparagus shows up right about now if you are getting it locally. But it’s only available for a relatively short period, usually only around 6 weeks in most parts of of the U.S.
Aside from its delicious flavor and versatility in many dishes(see the recipe links below for some simple dishes and downright daring ways to try asparagus), there are many nutritional benefits to these beautiful spears. 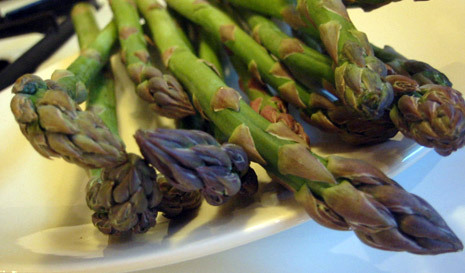 Asparagus is an excellent source of Folate and Vitamins A, C, and K, just to name a few. To pick up some of your own, look for bright green stalks with plump, tightly closed, tips. To store, before sticking them in the refrigerator, rinse with cold water, pat dry and wrap the base with the damp paper towel or store standing up in about an inch of water. Eat within 2-3 days for the best flavor and nutritional value. As I already mentioned, asparagus lends itself to many types of dishes; you can eat it raw, boil it, steam it, stir-fry it, the possibilities are endless. I like to toss some chopped spears in with scrambled eggs or serve the whole spears as a side dish by roasting them in the oven (about 10 mins. at 450) with a touch of olive oil and seasonings like thyme and rosemary. Hopefully you look beyond the photo that corresponds with this post and trust me when I say that this soup really is one worth trying. I was inspired by Liz’s peanut butter post, but must admit, I was very skeptical…. peanut butter with tomato? Onion with coconut? I was willing to try it, but prematurely apologized to my husband that it might not taste that great. Boy, was I wrong. I followed the exact recipe from VegWeb.com only I used tofu instead of cauliflower. (My husband is not a cauliflower fan, plus I like how tofu really soaks up the flavors). I used veggie stock instead of water, and also added the suggested coconut. The final product was so flavorful, and still tasted just as good (if not better) as leftovers the next day! The company was started in 1995 by herbalist and author Melissa Hertzler�who was experimenting�daily on her husband trying to come up with a shaving formula that agreed with his skin.��After eventually finding the perfect combination, she knew she was on to something�and Honeybee Gardens was born.� They are committed to�using 100% all natural ingredients (that you can actually pronounce), no animal testing and�complete customer satisfaction.� Not to mention,�their prices are pretty reasonable. 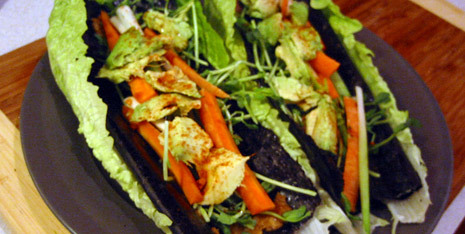 Instead of using a sheet of nori to�roll�everything up�into a neat, little, cylinder shape,�this method�uses a big leaf of romaine to hold everything together�and puts�the nori on the inside.��The nori is first smeared with a miso paste and then used to line the romaine before�piling on lots of other veggies and sprouts,� so you end up with more of a wrap (or a taco depending on how full you make it) than�the traditional roll.��In the wrap pictured above I used a favorite�Sweet White Miso with carrots, sprouts, avocado, scallions, and a dash of cayenne pepper. It was not only quick, but delicious and satisfying too. Yesterday’s post was partly inspired by my weekend spent in Las Vegas for a friend’s wedding. Admittedly, one of hardest things for me to avoid when I travel is picking up unnecessary souvenirs for myself, family and friends. Unfortunately, when those souvenirs are mass-produced in other countries, it probably isn’t supporting the economy of the city you are visiting. However, on my trip this past weekend I did purchase something made in another country, and I couldn’t feel less guilty about it. I’ve had my eye on these Gecko Trader Bags for over a year, but I knew that I didn’t need another tote. However, when I saw these small ones for sale in the gift shop at Springs Preserve, I immediately picked up a pack. They are bright and colorful and perfect for carrying everything from credit cards to cosmetics. Gecko Traders (a Fair Trade Federation member) employs disabled and disadvantaged workers in Cambodia to make these 100% recycled rice and feed bags. Furthermore, I was glad that I could get them at a place that promotes sustainability, and even has LEED Certified Buildings on site. 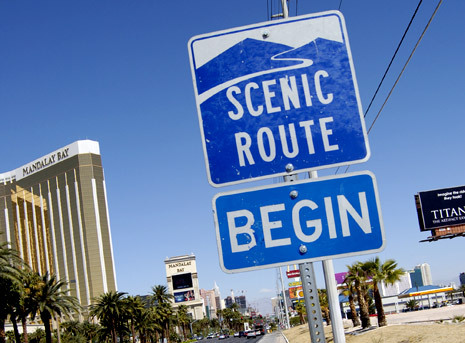 So one last tip for when your travel: Don’t be tempted by touristy trinkets. Instead seek out ones that are either made by local manufactures or artists, or look for ones that are made from recycled materials or are fair trade. Spring is here, which means that many people across the country are planning or taking a vacation. Traveling can be a great cultural experience but it also can take a toll on the environment if you aren’t careful. Follow some of the tips below so that even though YOU may be on vacation, your responsibility to the environment isn’t. Before your go, get your house in order. Put a hold on your mail and newspaper, unplug electronics and appliances, set timers on your lights and adjust your thermostat. If you’re flying, check into offsetting your carbons and don’t overpack. Whether you are flying (or driving), a heavier bag will require more fuel. Check the weather so you can pack accordingly, and try to plan your outfits based on one color scheme so you can minimize the amount of shoes, belts and other accessories that go along with them. Opt for a hotel that has an environmental conscience and once there, treat your hotel room as you would your home. Take short showers, turn off the lights when you leave and unplug your electronics. Request to reuse the same towels and sheets. Many hotels have simple cards you can put on the bed that make this request for you. If not, just let the front desk know. Once you leave your hotel, choose your transportation wisely. The best way to see a city is often on foot. If you have further to go (and are familiar with the city), you could rent a bike. If you wish to travel a bit faster, take public transportation or look for a hybrid taxi. Consider your destination. Research eco-vacations and you may be surprised what options are available. Some sites to check out are Eco Tours, Sierra Club Outings and Sustainable Travel International. Last but not least, consider being a tourist without leaving town, and you might just leave the lightest footprint of all!